Cyclone Idai has caused widespread devastation across south-east Africa. We've listed some key facts on the situation. More than 1.7 million people are affected in that country alone and the United Nations food agency says while flood water has started to recede in Zimbabwe and Malawi, Mozambique is facing "a major humanitarian emergency that is getting bigger by the hour". Survivors are said to be trapped on roofs and clinging to trees waiting to be rescued, according to UN agencies. While in all three affected countries people have lost their homes and crops, as well roads and bridges that were swept away by the flood waters. The president of Mozambique Filipe Nyusi has estimated that more than 1000 people may have died. 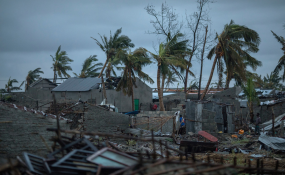 Aid agencies like the The International Federation of Red Cross and Red Crescent Societies, Gift of the Givers, Medecins San Frontieres, and UN agencies like the World Food Program are working to reach and assist the affected people with emergency supplies. The World Health Organization is also preparing medical supplies to deal with possible outbreaks of disease such as cholera. Zimbabwe's Meteorological Service Department (MSD) issued warnings of the approaching storm two weeks before it made landfall. MSD director Tichaona Zinyemba said the cyclone would "generate torrential rains and exceedingly strong winds, resulting in flooding and destruction of infrastructure along its path". Zimbabwe's treasury has released U.S. $18 million in funds to rebuild infrastructure as well as provide water and electricity. Deaths in Zimbabwe were largely isolated in Chimanimani, a mountainous region along the eastern border with Mozambique and is a popular tourist destination. According to government spokesman Nick Mangwana, no tourist deaths were recorded. Satellite imagery revealed that Malawi's Chikwawa district was particularly badly affected by flooding due to the storm. At least 922,000 people have been affected by the hurricane with at least 56 people dead, 577 injured and 125,000 displaced. Gift of the Givers founder, Dr Imtiaz Sooliman, said the non-profit organisation was working with the Malawi Defence Force to help affected no-go areas. Teams are also distributing essential supplies to seven out of the 11 affected districts in the southern region of Malawi.